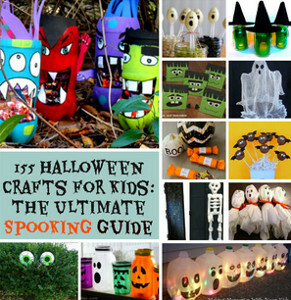 Halloween is a great time of the year to get your craft on. 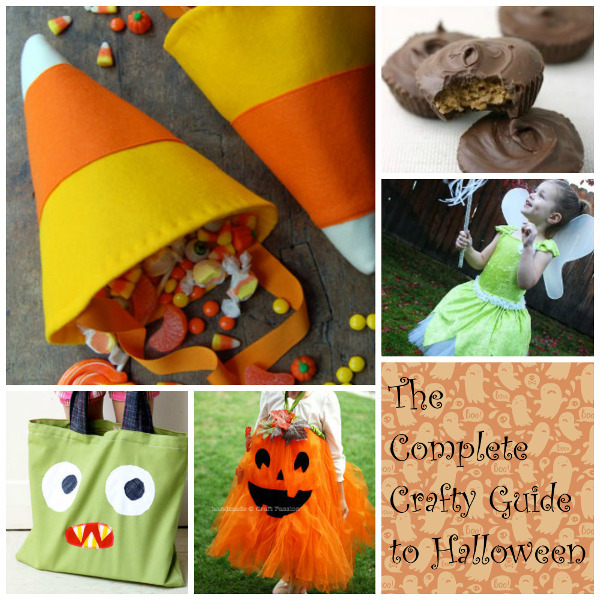 Whether you make your own costume, decorate your home, or carve your own pumpkin, there are so many ways that you can celebrate the holiday with your own handmade ideas. 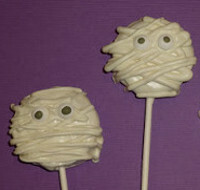 One of my favorite projects for Halloween involve no cutting or scooping at all. 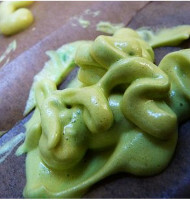 No need to get all that nasty pumpkin goo on your hands or in your house if you don’t want to. 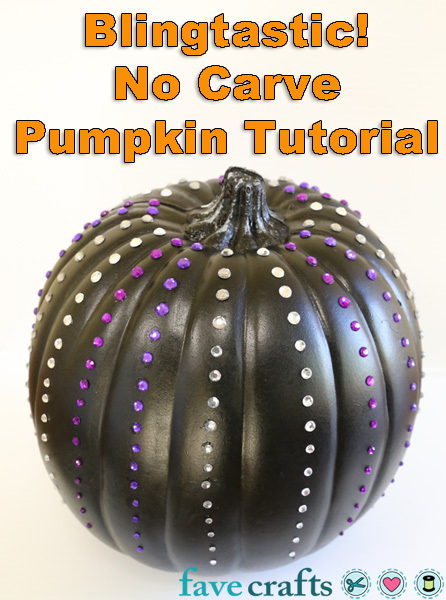 You can create a no carve pumpkin that will be a staple in your Halloween decor for years to come. 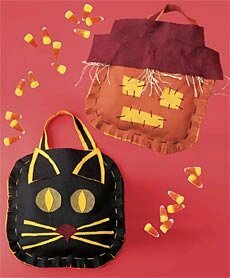 We’ve teamed up with Elmer’s to bring you this awesomely easy Halloween craft, that takes very few supplies. 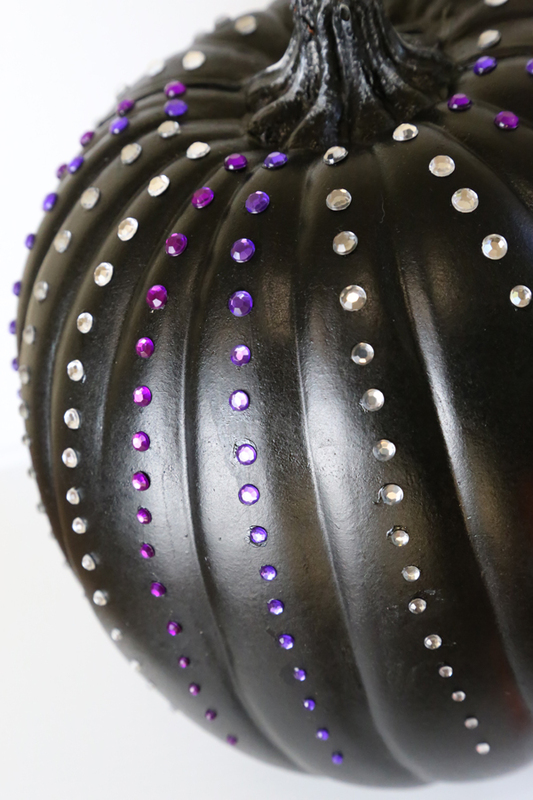 Just because you aren’t spending that much on product, this rhinestone pumpkin will make your Halloween set up look like a million dollars. 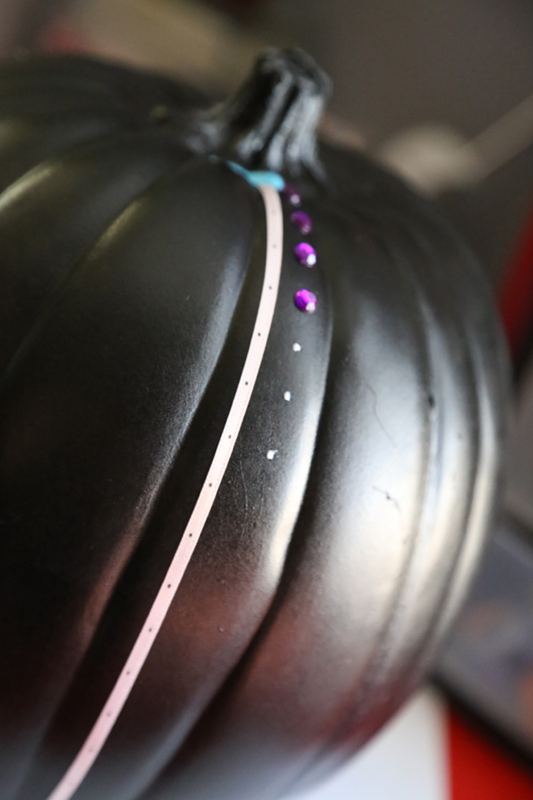 Use a scrap piece of ribbon, marker, and ruler to mark off how you want your rhinestones spaced on your pumpkin. 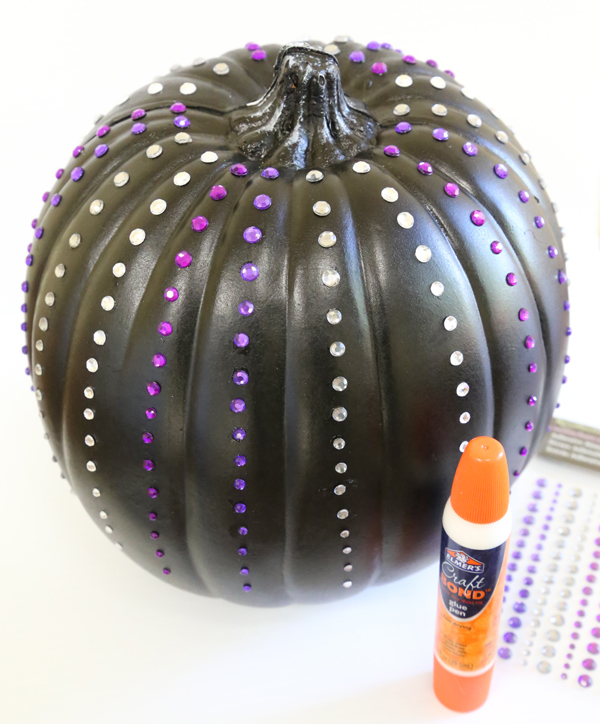 My pumpkin was 8″ tall and I spaced my rhinestones every 1/2″. 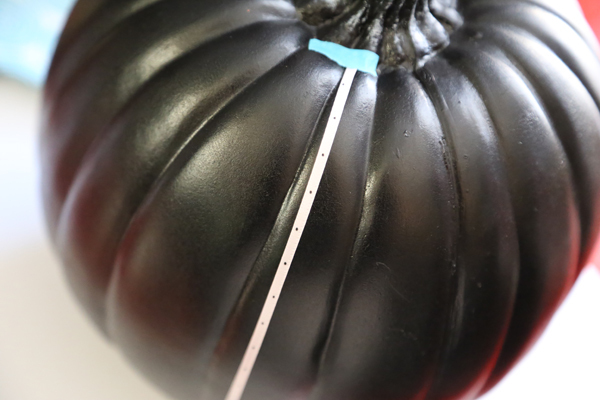 Secure your ribbon to your pumpkin as a guide for your rhinestones. I used masking tape but any tape will work. 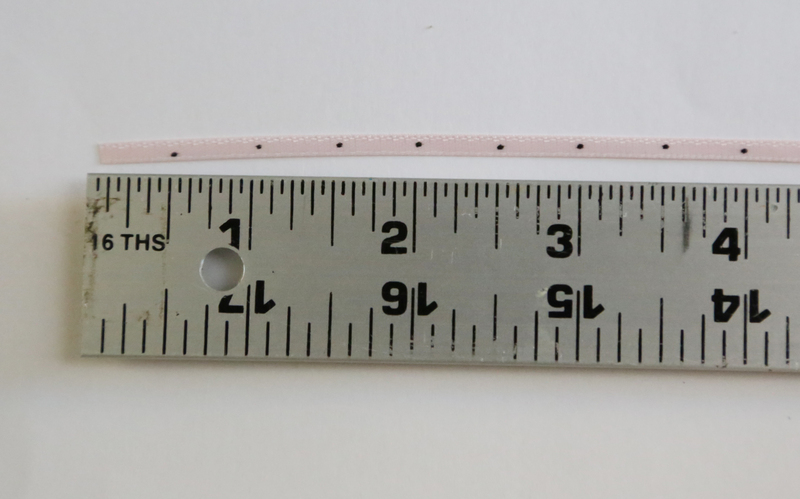 Squeeze out small dots of glue according to your guide. This glue works great, so you only need a small amount. It also dries completely clear, which is awesome. Once you complete the first row, you can use that row as your guide for the rest or resecure the ribbon to the next area as your marker. Complete each section and go all the way around your pumpkin. 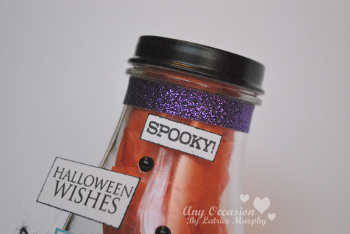 This is a very simple craft and I’ve seen plenty of blinged out decor lately in the stores but you can make this fabulous Halloween craft for a fraction of the cost. The results will impress your friends. 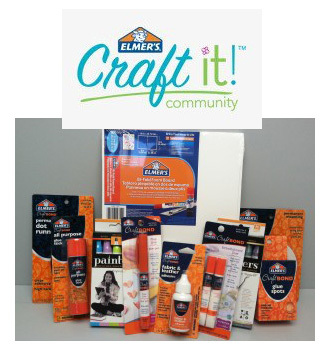 Don’t forget to tune into the Elmer’s CraftIt Facebook page tomorrow, October 10th at 8p EST for a fun chat about fall craft ideas and a chance to win a great prize! Halloween’s fast approaching, and with all this preparation for costumes and parties, it’s easy to forget about decorations for the outside of your home. I can’t count the number of times I’ve been stuck rushing from store to store in a last minute attempt to find Halloween decorations (not even thinking about the price!). The editors at AllFreeHolidayCrafts don’t want you to be stuck in the same situation this year, so we’ve put together a quick list of some hassle-free suggestions for outdoor Halloween decorations that we think you’ll want to try out. Along Came a Spider Wreath – Wreaths are all the rage, and this one is the perfect combination of freaky and fashionable. The bright green color really stands out, and the feathers add a creepy twist. 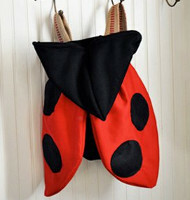 This is one Halloween decoration that will add some festive attitude to your decor. Pretty Perforated Pumpkins – This is one of the chicest Halloween decoration ideas that we’ve seen this year. 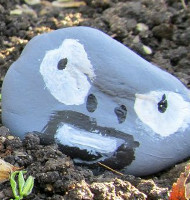 It’s so simple, but the effect is sure to draw attention to your front yard. Not all pumpkin carvings have to be tricky to look eye-catching. Spiderweb Silhouette Lantern – Pumpkins and Jack O’Lanterns don’t have to be your only source of light. Bring a professional look to your outdoor Halloween decor without the price tag. 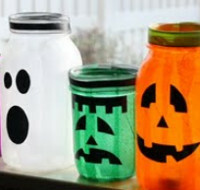 Use your favorite Halloween templates to design your own lantern that’s sure to last year after year. Clever Graveyard Headstones – For a vintage look, design your own Halloween headstones. Whether they’re funny or frightening is totally up to you. 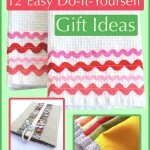 This is a great way to get ideas from other creative family members as well. 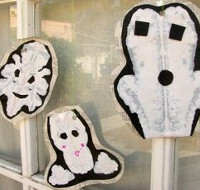 Garbage Bag Lawn Ghosts – Animate your lawn with characters made entirely of household materials. 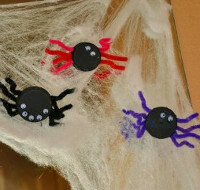 If you don’t want your decorations to be too scary, get your little ones to help you draw on some happy faces. 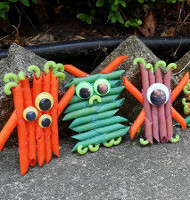 You can even create a fun little pose for them to do in your yard. Blood and Guts Yard Prop – If you’re looking to give trick-or-treaters a bit of a scare, try out this thrifty Halloween craft. You won’t even need to spend $10 on it because it’s made with recyclables from around your house. Who knew such detailed props could be created from everyday objects? 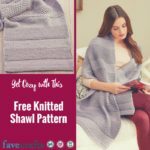 DIY Life Size Mummy – Be daring by creating something big and bold to stand on your front porch. This Halloween decoration is also great for indoor parties or haunted houses. There is no way you’ll find anything like this in stores. Milk Jug Ghosts – Recycling crafts are getting more and more popular this year, and this one is the perfect way to guide guests to and from your home on Halloween. Find a new way to dress up your lights that’s both kooky and eco-friendly. 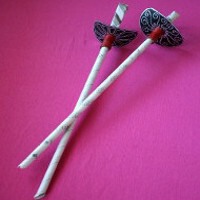 This project is also a great kid’s craft, as it’s safe and only requires a permanent marker and their imagination. If you loved these handy outdoor Halloween decor ideas, head on over to our site for more spectacularly spooky craft projects. What’s your big Halloween project this year? 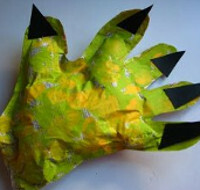 Turning Trash into Treasure: Halloween Style! In general I don’t consider myself an especially “green” person. There is, however, one major exception. 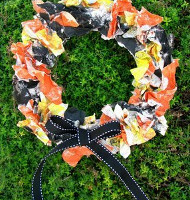 When it comes to holiday decorating, I love making crafts from recycled materials. Not only does it save me some cash (that I can then spend on more important things, like Halloween candy! ), but it also lets me get creative, finding unique ways to to turn things from my trash bin into really cool decorations and other fun Halloween stuff. These Plastic Bottle Skull Lights are going to look awesome strung up on my front porch. I love the way they glow and the little skull faces are too perfect! I can’t get over how clever this idea is — plus each light comes out to about 50 cents since the only materials you need are empty milk bottles, some electrical tape and battery-operated tea lights. 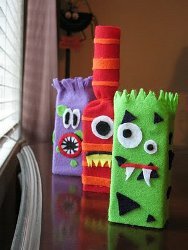 When I first saw these adorable Mummy Boxes, I knew I had to make them for my Halloween party. Not only are these mummies the perfect Halloween prop because they stand up on their own, they’re also incredibly cheap to make! Basically all you need is an old white sheet and some recycled cardboard boxes and you can fashion yourself this spook-tacular Halloween decoration in under an hour! Last but not least there’s my absolute favorite Halloween recycling craft: this ridiculously clever Broom with Crushed Can Witches. I’m not a huge fan of wreaths for Halloween — I think they’re just too pretty, and Halloween is supposed to be about all things spooky — so I’m loving this alternative door decoration. I think it’s so funny how the witches are screaming out for help as they melt into the broom — or at least that’s what I’m imagining is going on in this scene! If you’re like me and have a slight addiction to Diet Coke — or any other canned beverage for that matter — you already have one of the key supplies! Just grab a broom prop from the Halloween store (or use a real one if you want to be really authentic) and gather a few additional supplies and voila: you have an awesome Halloween decoration unlike any other on the block! I think you can tell how excited I am to make all of these projects. The idea of a totally “green” Halloween just seems really cool, not to mention trendy. 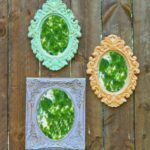 If you’re interested in going green for Halloween too, check out these 17 Halloween Recycling Crafts. 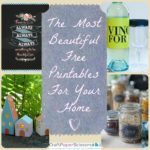 Go take a peek in your recycling bin and see what kind of treasure you can find. 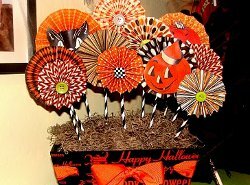 There’s no sense in letting perfectly good trash go to waste when there are fun Halloween decorations to be made! 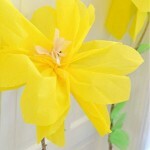 I’m curious: Have you made decorations from recycled materials before? What have you made? Can you believe Halloween is just around the corner? I haven’t seen many home decorations up yet, but I’ve certainly seen them all in stores along with all the thousands of bags of candy! I won’t lie, I bought myself a bag of candy to leave in my desk at work; we all get sweet cravings, don’t we? 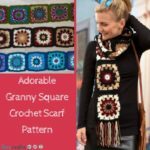 Anyway, with the fun holiday quickly approaching I wanted to share my collection page with you of 10 Pumpkin Patterns: Free Crochet Patterns to Make for Halloween. There are cute patterns in here for everyone. Make a little baby beanie for baby’s first Trick or Treating experience or crochet some fun holiday decor like the Crocheted Easy Halloween Trio. 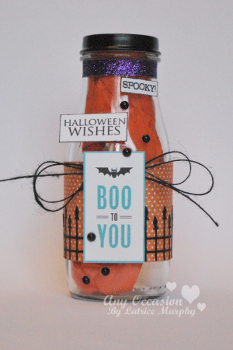 Whatever spooky ideas you have for Halloween can turn into some pretty crafty projects! Which Pumpkin pattern is your favorite from this collection? 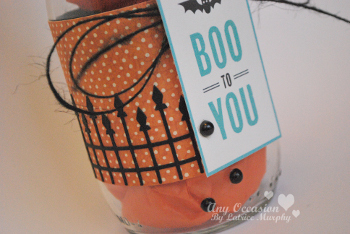 Monthly Craft Question: What’s Your Favorite DIY Project to Make for Halloween? 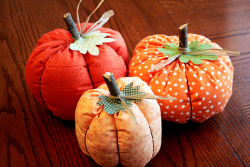 For October, the monthly craft question was: What’s your favorite DIY project to make for Halloween? What did you make this year? Who better to answer this question than some of our favorite craft designers and bloggers? 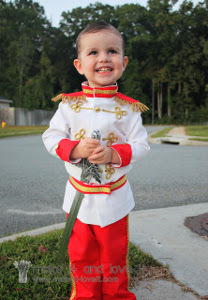 I love to make my kids’ Halloween costumes! We try to brainstorm something original each year and we make it ourselves because we know that handmade costumes always win the costume contests! This year we made a tongue-in-cheek Lady Gaga with meaty doggy toys and a Krispie Kreme Zombie named “Krispie Skreme”. I love crafting for Halloween This year I created 4 projects in various techniques, a basket with a decoupaged pumpkin, a treat tote bag repurposed from a teeshirt, a pumpkin placemat and a Halloween apron with a spider pocket. I loved them all but my favorite is the apron. I love sewing and designing aprons and this apron was a lot of fun, created in orange and black with rick rack and button embellishment. 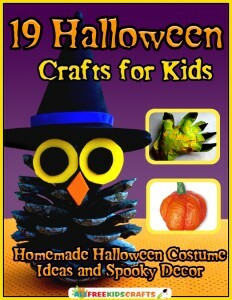 The instructions for all my craft projects are free on my blog and are designed so that by omitting the “Halloween” embellishments, the projects can be used for other seasons. My favorite DIY project for Halloween is making the kids costumes. 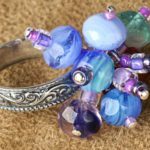 It gives me the opportunity to really go above and beyond with the creative thinking to make something practical or not, full of fun. I get excited when I find things around the house that can be transformed into something new and maybe even a little magicall. Also, I really love having another excuse to use my hot glue gun. I stepped out of my comfort zone and made a pop-up bat from a Sizzix die designed by my friend Karen Burniston. I put it inside my ScoreBoard Memo Holder and surprise- out pops a bat! See blog post with photos here. 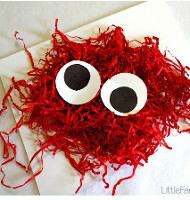 Note: to learn how to make this cute craft, visit Allison’s blog above! One thing we cannot do without each year are Jack-o-Lanterns. We always allow the kids to draw the design and cut them out. When they move out, it’ll be us adults taking on that role. The next DIY project would be pumpkin seeds from the pumpkins that are carved. It is probably the only time of year we actually eat pumpkin seeds. As for an artsy DIY project, we get creative with our foods. We like to make funky food. One year we made vomit soup, another year we made frankenstein meatloaf. This year we made bread hands. I have two favorites so if either interest you, feel free to use. 1. A Halloween Tree. Already had tree which we made last Christmas, but what was such fun was making the ornaments with our grandkids. Here are some of the ornaments we made, then the tree. 2. Item I loved making was the oddest pumpkin family ever. I enjoyed doing this because it was so quick, easy, fun and used up leftovers. Link to blog post on this one. Halloween is not really celebrated in Australia although it is gaining in popularity, especially amongst children! After all, what kid doesn’t like candy! 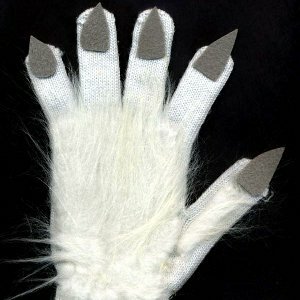 So crafting for Halloween isn’t really big down under either. 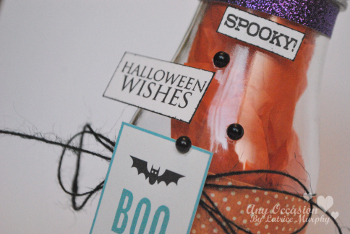 But this year I created a Faux Perfume Bottle necklace in Halloween colours to mark the occasion. The one DIY project that really stands out in my memory is a decorated wire hanger. What does that have to do with Halloween you ask? When I was a child, my mother Aleene had my sisters and me make hand-made gifts to give to each of the houses where we went trick or treating. 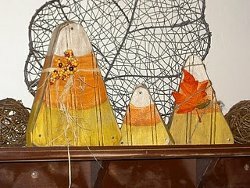 I remember when we said Trick or Treat and would get our treats, we would give a gift of bump chenille covered wire hangers decorated with pretty ribbons and flowers. The house owner was always so surprised to get a gift back! I didn’t realize it at the time, but it was actually a brilliant marketing idea for my mom to promote the classes at her store. For me Halloween is really a time to celebrate fall. 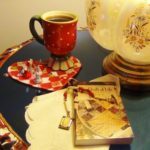 I love the colors of fall – the trees still grasping on to their brilliant green leaves while bright red, orange and yellow leaves dance in the wind. I have several projects underway in my studio which celebrate the colors of fall! I set up little fall and Halloween vignettes all around the house. I pile up raffia, and place real and fake pumpkins and gourds in place, while tucking in other fall items like branches, leaves, etc. I use the same items each year but in a different way. Everyone thinks I spent forever setting up the displays but it only takes a couple of minutes. Above is a link to a project I did for Modern Surrealist on Craft Critique. Marisa also carved this super cool pumpkin using Westcott Titanium Cushion Grip Hobby Knife. I made my one-year-old daughter Elise’s Halloween costume. It was a dress with a big sun on the front, rainbow on the back, and a sun hat with rays on it. All made out of fleece and felt so it’s super cozy. She is my little ray of sunshine! 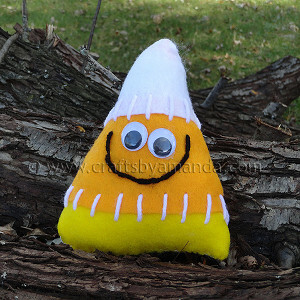 I like any unusual colored Halloween items – I love purple, orange and black but I also like to use something unexpected! This year I made a silver wreath with a glittery turquoise skull and blue and green bats. It says “BOO” in big turquoise letters. Same Halloween icons but with a special twist! My favorite Halloween project? Always, the costumes! My children are too old for trick or treating, so I make costumes for various kids of friends, or some of my students at school. This year I made a beautiful fairy princess for a 6 year old, a caveman costume for a 10 year old, a mermaid for a 7th grader, and a Heath Ledger Joker costume. Of course I worked on my own costume, too – a gypsy fortune-teller. 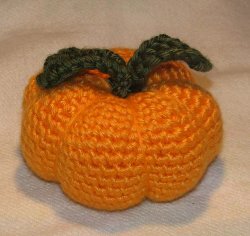 This year I only made one little pumpkin, but i’m also about to work on a loomchet (crochet on a loom) corn shuck today. One thing we cannot do without each year are Jack-o-Lanterns. We always allow the kids to draw the design and cut them out. When they move out, it’ll be us adults taking on that role. The next DIY project would be pumpkin seeds from the pumpkins that are carved. It is probably the only time of year we actually eat pumpkin seeds. As for an artsy DIY project, we get creative with our foods. We like to make funky food. One year we made vomit soup, another year we made frankenstein meatloaf. This year we made bread hands.